In order to fund these philanthropic outcomes from year to year, the Trustees manage diverse investment portfolios, comprising financial investments and a 740ha sheep and cattle farm. All income is internally generated with no reliance on fundraising: the Trust is perpetual and self-sustaining. “…I have had a very rewarding and fulfilling life. Apart from whatever success I may have achieved in business, the development of Puketutu Island and involvement in the arts has been absorbing interests. In particular, I have enjoyed the contact with people from many different walks of life with whom I have become associated through my varied interests and the strong friendships that have resulted”. Sir Henry Joseph Kelliher, was born in 1896 into a pioneering farming family in Central Otago where he developed an enterprising spirit and abiding love of the land. In 1921 Sir Henry set up Kelliher and Co, an exporter and trader in agricultural products. He went on to co-found Dominion Breweries and this was to remain his dominant business activity until 1982. Sir Henry received a Knighthood from the Queen in 1963 in recognition of his industrial leadership and philanthropy, and was also a Knight of the Order of St John. In the same year as Sir Henry was knighted, he established the Sir Henry Kelliher Charitable Trust and . The Kelliher Art Award had been in existence since 1956. The Trust had a strong focus on economics and the arts, with charitable grants aligning with the mandate of assisting those in financial hardships or with disabilities. In 2011 the Kelliher trust transferred ownership of Puketutu Island to a Trust set up by the Auckland City Council and Watercare, with the agreement of all parties that the Island would be opened to the public as a farm park, for the enjoyment of all, in perpetuity. 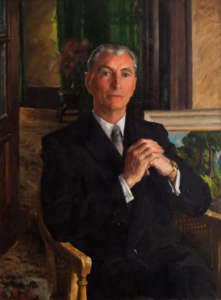 Following that the Kelliher Charitable Trust made two substantial grants in recognition of Sir Henry’s original Trust objectives, in particular the Kelliher Art Trust and the Kelliher Economics Foundation. The first was to the Auckland Art Gallery development project, and a gallery space within the building is now named after the Kelliher Art Trust. The second grant was to the University of Auckland Business School, whereby an endowment fund was established for Post Graduate Scholarships in economics. A relationship with both these organisations is maintained today and the Trust follows their activities with interest.